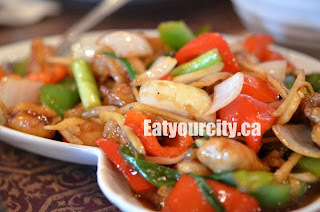 Eat Your City: Viphalay Laos and Thai Restaurant Edmonton, AB - Back again for flavorful Thai Tea and spicy fare! Viphalay Laos and Thai Restaurant Edmonton, AB - Back again for flavorful Thai Tea and spicy fare! We return to Viphalay Laos and Thai restaurant to try some of the items we missed out on last time. Service is excellent with waitstaff treating customers like family in the dining room decorated in rich red, ochre and dark brown woods with gold and black accents - the renos were done by the talented family! Congratulations also to Susan, owner of the restaurant with your little one on the way! With 99% of the menu is gluten free, people with Celiac disease can rejoice and indulge in not only gluten free foods - but tasty ones at that. Everything is still served family style, so we quickly called up some friends... everyone picked 1-2 dishes so we could nibble and sip on a broad range of the menu. We ordered a round of their infamous Thai tea - a deliciously strong blend of red tea (steeped in a special pressured machine), 58+spices, cream, condensed milk served with a bit of ice (pictured above to the right). There is a nice balance between the slight bitterness of the strong red tea tannins, creamy sweet condensed milk, richness from the cream and teasing hints of complexity and flavor from the 58+ herbs and spices. 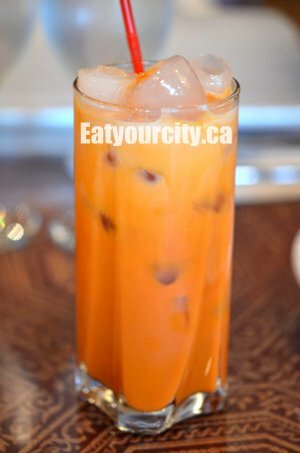 Flavorful and rich, we sipped, savored and used the Thai tea to cool down our mouths after more fiery selections. Nommy! 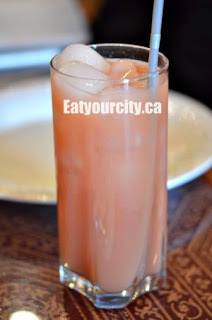 We also ordered some fresh guava juice - aromatic, fragrant and sweet - this refreshing and pastel pink juice was served over ice in a tall glass. This green papaya salad came with shredded tart crunchy-crisp papaya, shredded sweet carrots and tomato wedges all tossed in a spicy sour fish sauce based dressing. 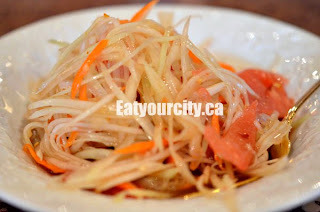 Tangy, salty, sour, spicy and crunchy, this salad hits the palate with a multitude of flavors and textures. Some of our party really enjoyed it, while others found the flavors a bit overwhelming. For the weak of heart - ask for the chili's to be toned down as this dish is fairly spicy. 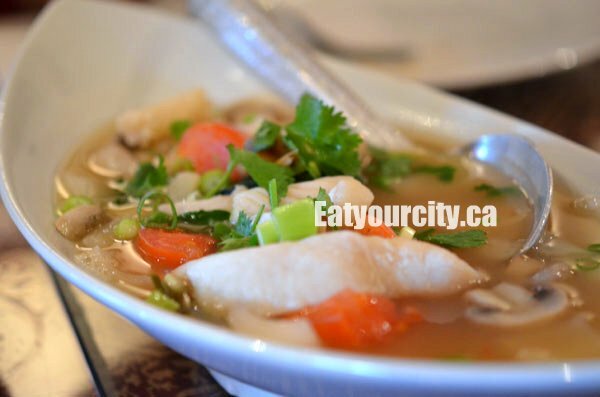 This seafood soup was a swimming with chunks of basa fillets, large shrimp, mussels, scallops, mushrooms, tomatoes, cilantro, green onions, and onions in a light seafood consomme - aromatic with lemon grass and kaffir lime leaves. Probably the most delightfully light seafood soups I've had in a long time. Hell's beef. Well, the name "should" be scaring off people. Instead, we were intrigued by its description - marinated in spicy peppers, coated in chili's before being cooked in hell's oven. We dare each other to order it, and before long, we were popping these flavorful pieces of tender beef into our unsuspecting mouths. 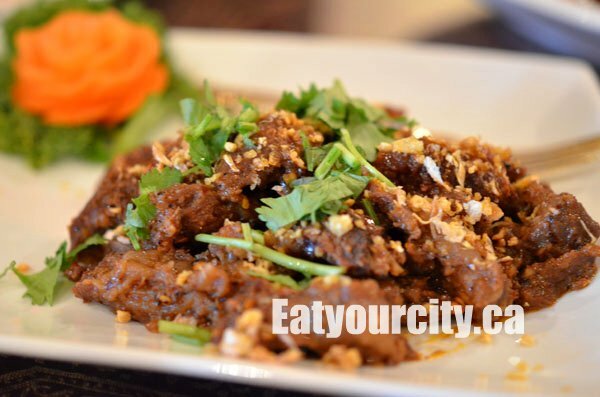 You get a hit of fried garlic and aromatic citrusy notes from crispy crushed chilis, before you hit the tender beef. Its very tasty, though the heat hits you shortly after and you'll be reaching for your Thai tea, water, coconut rice... anything to cool down the burning inferno that's lit a path down your throat... Pooooooooooooooh! No - these noodles aren't swimming in an alcoholic bath. They're meant to be eaten after a long night of drinking. These noodles are tossed in a slightly sweet, savory and spicy sauce with plenty of veges and tender beef pieces... it is perfect for post hangover snack - regardless if you have a hangover or not. Nom! Traditional offerings include purple rice with mangos and icecream, steamed taro custard with cream and roti rolls, or banana envelopes - banana filled pastries drizzled with maple syrup, icing sugar and cinnamon for a Westernized twist on things. We went with one of our favs with no hesitation - the Roti rolls!!! Soft tender roti dough pan fried to a crisp yet slightly chewy exterior, and rolled up with a rich caramelized condensed milk syrup (like a thin dulce de leche) with hints of vanilla and caramel. Nom! After the owner let us know the mango dessert was especially good tonight as they just got in a fresh batch of very ripe mangos, we were sold. 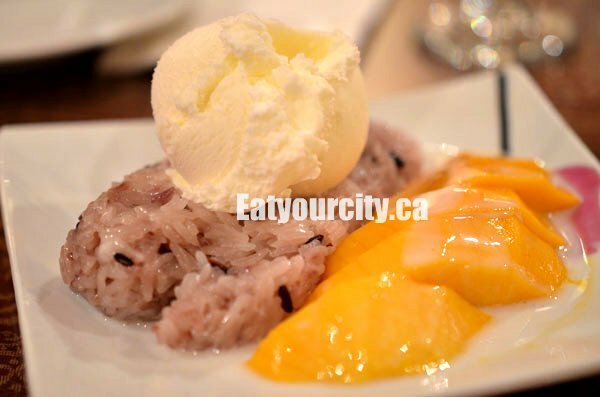 The melt in your mouth super ripe mango slices is paired with coconut milk infused and sweetened purple sticky rice, topped with vanilla icecream and drenched in coconut milk. Mmmmmmmmmmmmm! Since you didn't order it, just for the record, their Pad Thai was among the best I have tried, specially if you lean towards tamarind based, rather than the Westernized catsup based. I also ordered the Hell's Beef but, alas, my reaction was not as exciting as yours. 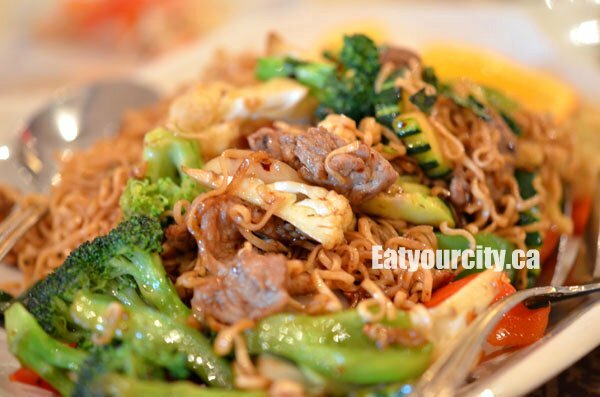 We thought it was more on the lines of cooked beef, slice and tossed with some other ingredients. I just moved to Edmonton, and as a guy who really enjoys eating and checking out new places this place was recommended to me. My wife and I went and thought it was really good, with the surprise being the drunken shrimp (not sure if that is what it is called exactly). I was questioning shrimp in a red wine sauce, but it was really awesome. give it a whirl next time. Simply mouth watering. The drinks look refreshing and the cuisine is a delight to the senses. I am now clamoring for some Thai food. 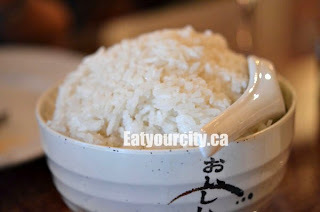 I went here based on good reviews and wouldnt go again! Food wasn't spectuaclar and service made it worst! Server, after me having to mention no one asked us for our drinks, told us they dont have coffee because they are too busy to make coffee?